division of KAZ Consulting, LLC. Sunset Reports is based on award winning components and proven technology, and provides users an alternative to such software as Crystal Reports, SSRS, and others. The report designer handles all types of content. And you can even import report designs from other software as well. The report queue allows for scheduling of reports, file and document distribution including recurring schedules and provides easy to use list and calendar views. Besides using Sunset Reports as a reporting tool, it is perfect for information management, data analysis, business analytics, visualizations, web site design, making labels, data conversion, document management, document distribution, and lots more. So a company in the construction business is using accounting software like QuickBooks or Timberline which have built in reports. The reports can be customized to a certain extent and most of them produce the output that is needed for the standard needs of a company. Using a product like Sunset Reports can take it to a new level with custom reports from scratch where the user has complete control over the content. Plus, the ability to schedule reports and distribute them in a variety of ways is something almost no accounting software can do. Two big advantages. But there is more…. The same company is also using a project scheduling package like Microsoft Project and another package to manage contracts, subcontractors, communications, change orders, etc., and then another software program to do take-offs and estimates. Each one is perfect for the function it performs, and each one creates reports as necessary. But you cannot combine the information from all these software packages to produce reports that tie it all together unless you use a program like Sunset Reports. A really BIG advantage. 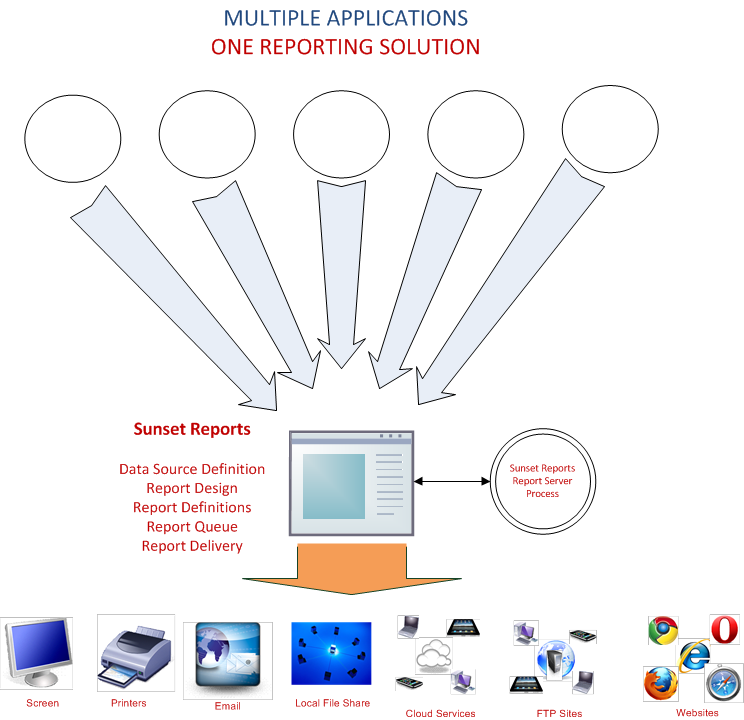 Sunset Reports not only can connect to almost any software package to use as a data source, but it can combine the data sources onto one report. A single reporting solution that will provide consistency across all applications and is fully customizable with the ability to schedule the reports as well as send them or publish them to a variety of destinations and in a variety of formats. This scenario is not only applicable to the construction industry, but also to materials, consumer goods, financial, healthcare, manufacturing, retail, publishing, technology, utility industries, etc..
We will explore a couple of these in more detail in future posts. If you are using the product for something not on this list, drop us a line, we would love to hear from you. Intuit has provided an ODBC source called QODBC which is a data source interface to Quickbooks. With this ODBC interface you can extract data from Quickbooks allowing reports and other information gathering applications to use the data. A version of Sunset Reports is included in a product called CleverQ which can extract Quickbooks data in a different way and can provide dashboards, gauges, scorecards, charts, reports, and more. It can also import data from Microsoft Excel, Access, and other compliant ODBC databases. Click HERE to find out more. Sunset Reports can work as a “Report Server” similar to SQL Server Reporting Services (SSRS) and Crystal Reports. The difference is Sunset Reports is much easier to implement and does not provide a web based interface. No actual server software exists. Instead a Windows Service is run on any Windows based computer including XP, Vista, 7, Server 2003, and Server 2008. The service or “Report Processor Service” as we refer to it, runs in the background whether a user is logged on or not. It runs off a report queue which has a list of reports to run, their scheduled time, format, destination, etc. Reports can be added via the Windows based user interface, or from an email request. 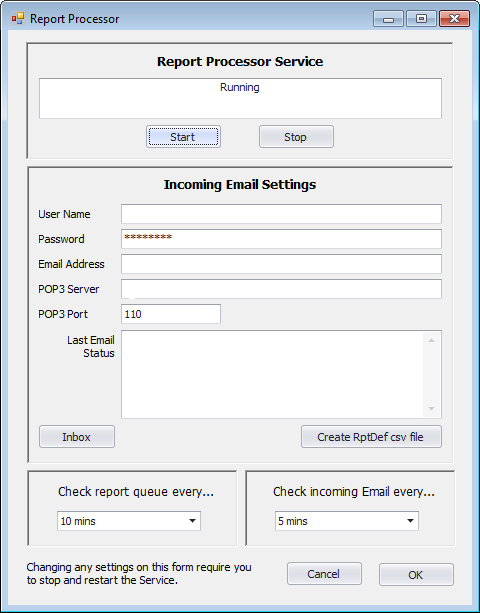 The Report Processor Service also monitors an incoming email inbox for requests. Reports can be saved in a variety of formats and even FTP’d to a website. Please note that we no longer provide a free trial version at this time. Copyright (c) 2011-2019, Software for Professionals, division of KAZ Consulting, LLC. All Rights Reserved.